Last week Edelman hosted a strategy session with our clients and partners at eBay and I had the opportunity to pull two of eBay’s social media leads aside for a quick chat. Richard Brewer-Hay has been with the company just over two years and has already brought a face to many of eBay’s social initiatives through his eBay Ink blog as well as his consistent engagement with eBay users in forums and nearly every community imaginable. Julie Haddon, a former Twitter employee who recently returned to eBay after working there from 2003-2006, has moved back to the iconic brand in a global social media strategy role. While eBay already has a presence on social touchpoints such as Twitter, Youtube and Facebook, the day was focused on looking at how the brand can dial up engagement with buyers, sellers and employees in a meaningful and scalable way. We’re very excited to be a part of this as eBay boasts some of the most engaged users on the planet and this makes for fertile ground. Have a listen to what Julie and Richard have to say and think about how it applies to your own organization. We're treating social media like Fantasy Football, Baseball etc. Except even those feel more like the real thing. Here are some social media fantasies vs. what I believe are the realities. Fantasy: Social media shouldn't live in a silo, so we are adding these responsibilities to your existing job. Reality: Day jobs will always win and moonlighting only makes you tired. Reality: They don't actually use latest social platform X, but they've read about it on a blog. Reality: People do love coupons! And they love you only as long as you give them freebies. Fantasy: It's all just media. Reality: It's actually about interactions—and media needs to work in tandem with those. Fantasy: People need to be educated. Reality: Online, people educate themselves. Fantasy: It's another place where we can tell our story. Reality: Participants care more about their story than they do yours. Stop deleting their comments. Fantasy: They will tell friends! Reality: Getting someone to tell a friend about you requires being remarkable. Are you? My reality check for the day. But I'm not giving up—sorry. The following is a guest post from Todd Defren, principle at Shift Communications. 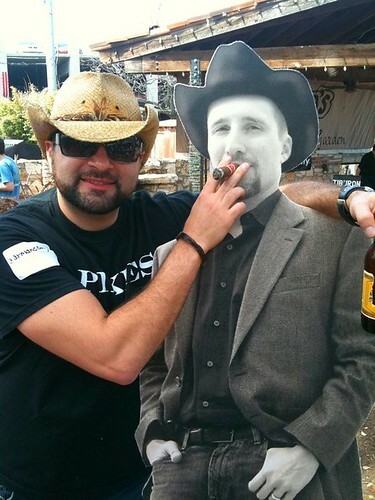 Todd recently awarded me with the prize of funniest photo of "Cowboy Todd"—his cardboard doppelganger of a replacement at SXSW. My prize? A guest post on his blog. But things have been really busy, so I asked him to write for mine. Enjoy. My apologies for the crude subject line, but it’s evocative of the truly memorable approach the Clinton campaign took back in 1992 with their in-house mantra, “It’s the economy, stupid!” This rallying cry was an ever-present reminder to the spin doctors of that presidential election season to keep the focus on what mattered most; to avoid getting sucked into sidebar scrapes that could derail their message and their candidate. It’s worth revisiting and re-crafting this refrain today — in a marketing arena in which the whole world’s gone topsy-turvy. As Social Media has blown up the silos between Advertising, Corp Comms, Direct Marketing, Public Relations, Customer Service, and even Information Technology, it’s easy to get caught up in the tools and techniques rather than focus on the sea change underlying this new madness. What’s this Social Media stuff really all about? It’s about the people. But a brand can no longer afford tweaks that drive up volume; they are increasingly realizing that they need transformative change that drives increased loyalty. Some brands are afraid of this new dynamic. I don’t blame them. Think about it: you are faced with the proposition to influence anyone with an Internet connection to publish nice things about your brand. That’s the best case scenario. It’s daunting! You realize that it is impossible to please all of the people all of the time, too — so your next-best-case scenario is that they remain neutral, and quiet. Most brands don’t know how to wrestle with this issue; it’s outside their comfort zone and training. So the default setting is to focus on the MEDIA part of the Social Media challenge. The communications plan becomes about content creation and social sharing. Let’s face it: it is a lot easier to just “count the retweets” than figure out how to transform a hidebound organization into a “people-pleasing” machine. But it’s possible. You can break it down into smaller parts. You can leverage your own people, for example. You can remember the SOCIAL part of Social Media — the “people” part. Most large brands (and plenty of smaller ones!) have their fair share of fans and followers. Beyond communicating with them via MEDIA, it’s fun to think about SOCIALIZING with them. When SHIFT helped coordinate dozens of “TaxTime Tweet-Ups” for H&R Block last year, we honestly had doubts about how many folks would show up to chat about topics like “April15thophobia” … Yet 100’s of people were more than happy to share a drink with the tax pros. Free advice and free drinks led to some great engagement — and scores of follow-up tax prep sessions in the subsequent weeks that were directly attributable to those simple get-togethers. Of course, in such a scenario it only helps if Joe the Tax Pro is also participating on Twitter, etc., so that a relationship formed over a beer can be loosely continued throughout the year. It only helps if Joe is creating and sharing media (answering questions on Yahoo! Answers and LinkedIn and Facebook, blogging, etc.). But that’s not the key takeaway. Let me make it simple. Less than a week has passed since the interactive portion of SXSW, a Mecca for the world's digerati, wrapped up. Some have written scathing reviews vowing never to return and others provided a more balanced look. From a sociological point of view, I'd argue that events like this serve up insights by the pound, if you are willing to look for them. Here are a few things I noticed and how you can apply these insights to the business world. Give People The Tools To Organize: Reward Participation. Each year SXSW spotlights a technology. This year it was the local/mobile platform Foursquare. The service let people within the local network sniff out which events and locations were "hot" by who and how many people were checking in. If you managed to find yourself at one of these trending locations you were rewarded with a "swarm" badge, a special limited badge that acts as a memento of the event. Foursquare allowed participants to manage the chaos to some degree and provided incentives to "check in." In the business world, these principals can be transferred to initiatives such as loyalty programs or internal collaboration networks. SXSW hosted lots of parties. People complained about the lines and everyone wanted to be on a VIP list (who doesn't?). While exclusivity has a downside (people feel left out), it also reinforces that those who have social connections don't get left out and reap the benefits. This was reinforced even in the small but tech-saturated petri dish in Austin and ensured that the people who are considered "magnets" would attract others to the right venues. Organizations can leverage this dynamic as well and typically do, through "influencer outreach" programs or singling out the accomplished such as Microsoft's (disclaimer, Edelman client) MVP program. The SXSW convention center reminded me of Times Square. Hundreds of vendors, brands and companies vie for your attention. The toll this takes on the average attendee is visible after a few days as many of us sought refuge in quiet places. The sensory overload was substantial and resulted in everything blurring into each other which made it difficult to stand out. One company managed to stand out in an understated way. Chevrolet sponsored all of the power supply stations providing adapters for every mobile device conceivable and power strips at every turn (disclaimer, Edelman client). Chevy was ubiquitous without being obnoxious. If you really want your business to stand out amongst the noise, do something useful. 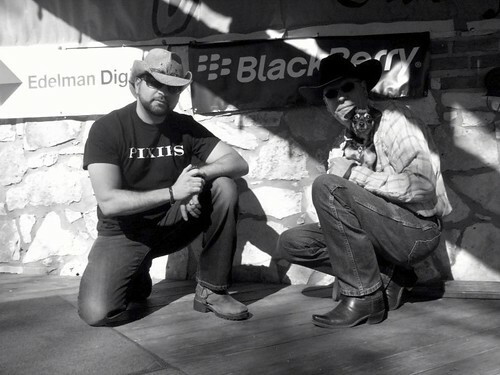 SXSW is one of the most informal conferences, with the dress code to match. But it doesn't stop there--attendees looking to set themselves apart from the crowd wear unique t-shirts, bring props such as a garden gnome and hand out business cards that double for bottle openers. The venue supports a sociological truth that human beings want to feel they are one-of-a-kind. You only have to walk through the halls of a high school to see this in practice. This insight proves to be especially relevant in marketing. Provide an experience where you can help people get noticed and they will reward you for it. The panels at SXSW are partially crowdsourced via user votes which also creates an expected sociological pattern. People get out and promote themselves and their ideas bringing even more attention to the event. In the case of SXSW, the number of panels combined with this approach have caused some to feel like quality of content isn't as strong as it could be. When going with the wisdom of crowds, be sure to balance what the people say they want vs. what you know they need. For further direction here, see Apple and Steve Jobs. SXSW isn't perfect but it's a lot like a successful social platform. It's like a live manifestation of Facebook. With more cowboy hats and, arguably, fewer ads. Social Media Is Dead: Long Live Common Sense. Tomorrow I’ll be speaking at a Chicago AMA (American Marketing Association) event downtown. They say it’s the first event fully dedicated to social media. At first I was tempted to do a “101” talk, not knowing what the level of the audience would be. Then I realized that the audience and myself would be better served if I stuck to my guns and made the message accessible. So that’s what I did. In the end, organizations are going to need to modify process, staffing, training, culture and even leadership if they want to integrate “social” in a meaningful way. And it will integrate—we’ve seen this movie before back in the early .com days. Hope to see you at the event. Please say hello if you can and use the hashtag #socialAMA. If you don’t know what that is, I won’t be helping you out in this presentation (that's social media 101). Edelman Digital: When Is Your Website A Community? One of the pet projects I've taken on since joining Edelman has been assuming the responsibilities of the "website", an initiative that as many professional services firms can relate to began to head down the path of the "cobblers children". One of the first things I was empowered to do was to hire a resource, fully dedicated to this property—this was probably one of the more innovative moves on the initiative since the property isn't a content destination nor a product platform. It does however allows us to be content publishers, facilitators and provides us with the flexibility to integrate 3rd party platforms (for example, a Foursquare widget will tell you who has checked into a local office). Having found the perfect community manager (Suzanne Marlatt), who acts as part curator, editor, blogger, and developer, we began to streamline efforts on the property to move it forward along our vision. Suzanne (below) and I both half jokingly describe this vision as a "Mashable for marketing", but that underscores our determination to not only create but maintain a valuable experience to the users who will subscribe and participate here. The site is in its infancy but built on Wordpress, it allows us to throw as much content and interactivity as that platform can withstand. But we all know this is not a technology play—this is a value play. This property needs to provide value to our clients, employees, peers, and potential job seekers. As long as we put these users first, and maintain the resources we've committed to it, I'm confident we could indeed provide the value we aspire to. Wish us luck—communities don't form overnight. So when you throw that stone—and you will, don't be surprised when you are picking up the pieces of your own house as it shatters around you. You'll be happier, healthier and wiser if at the end of the day, month or year if you've built something of value. If it helps others to be better—bonus. Even when you really, really want to throw in the towel. Fight as if you're fighting for your life. Maybe in some ways, you really are. If you're going to do something, go at it with everything you've got. Words such as these won't stop you from failing and falling short on a daily basis. If you aren't, then you're not really living. It's been around three months since I joined the team at Edelman Digital and whether you are a casual or frequent visitor here, you may wonder from time to time what I actually do. Here's a few things I've been focusing on. Since joining, I've worked on several new business initiatives, have been plugging into a number of clients including eBay, RIM (Blackberry), Chevron and several others. I recently hired a community manager who will work exclusively on our Edelman Digital property (not clients) and we've been heads down on planning our launch within the next few weeks. I've also been working on some internal frameworks, and have some definitive ideas in mind for ways to package our services. I've been traveling a bit less which has been really nice, and by design have dialed back the speaking engagements to a more manageable mix. Balancing being in the trenches and working at 30k feet is always tricky. I've certainly been reaching into my toolbox tapping every skillset I have from visual thinking, to strategy, to telling a story or communicating a framework. It's all good. I'm working with some great teams across several different offices and have been impressed by everyone I've worked with. I'm really excited about the long term vision we are crafting for the Edelman Digital property and how we will begin to execute against that as well how we are engaging with our clients at a business strategy level. In short, it's all systems go—and it feels good to be making progress. I'll likely see several of you at SXSW so if you are going, please be sure to approach me to say hello. I meet so many people who mention after the fact that they were going to, but never did. While the economy is proving to be shaky at best, I'm excited by the opportunities we have with many of our clients. This is a great time to be engaging your customers, employees and business partners both authentically and on their terms. 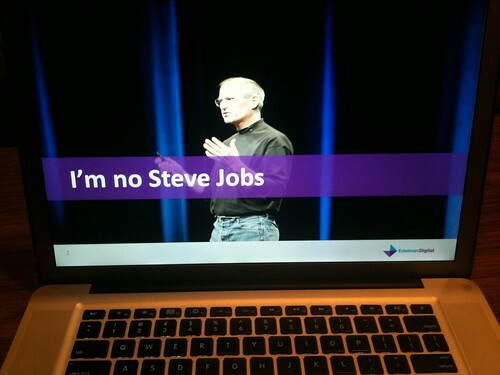 I'm no Steve Jobs, but anyway—that's what I think.